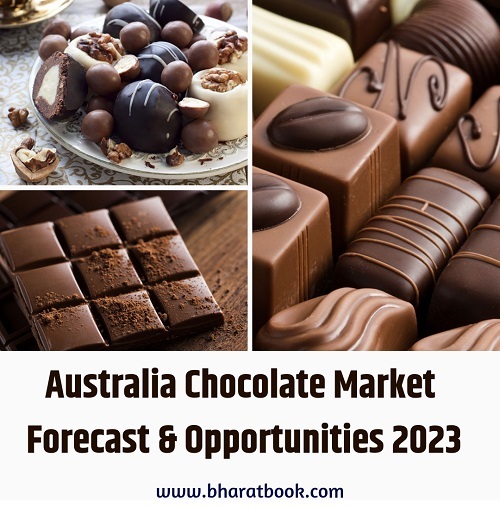 Bharat Book Bureau Provides the Trending Market Research Report on “Australia Chocolate Market By Product Type (Milk Chocolate, Dark Chocolate and White Chocolate), By Category (Tablets, Boxed Chocolates, Countline and Others), By Distribution Channel, Competition, Forecast & Opportunities, 2013-2023”under Consumer Goods Category. The report offers a collection of superior market research, market analysis, competitive intelligence and Market reports. “Australia Chocolate Market By Product Type, By Category, By Distribution Channel, Competition, Forecast & Opportunities, 2013 – 2023” chocolate market is projected to surpass $ 4.3 billion by 2023, on the back of growing chocolate consumption and rising demand for niche product categories such as organic chocolate products. Moreover, increasing focus of chocolate manufacturers on offering innovative products; for instance, Mondelēz launching Cadbury Dairy Milk with Oreo in mint and strawberry flavors, is expected to positively influence the country’s chocolate market in the coming years. Rising number of health-conscious consumers, increasing demand for premium chocolates and rapid expansion of e-commerce in FMCG are some of the other factors that would fuel growth in Australia chocolate market during the forecast period. Some of the major players operating in Australia chocolate market are Mondelēz Australia Pty. Ltd., Mars Australia Pty. Ltd., Lindt & Sprüngli (Australia) Pty. Ltd., Nestlé Australia Limited, Ferrero Australia Pty. Ltd., Aldi Stores Supermarkets Pty Ltd, Darrell Lea Confectionery Co. Pty. Ltd, Haigh Pty. Ltd. A.E., Stuart Alexander & Co Pty Ltd. and J.H. Whittaker & Sons (Aust) Limited. The information contained in this report is based upon both primary and secondary research. Primary research included interaction with Chocolate distributors and industry experts. Secondary research included an exhaustive search of relevant publications like company annual reports, financial reports and proprietary databases.